Advancing Youth Engagement Worldwide Since 2001. Our society is deeply entrenched in adultism, which is bias towards adults and consequently, discrimination against young people. It is prevalent throughout the institutions of our society. In order to re-negotiate adultism, we have to identify what support has to exist throughout society. I call this support “scaffolding”. I call this re-negotiating “youth integration”. The first step is desegregation of youth, which is deliberately ending the segregation of young people throughout society. Today, segregation happens implicitly and explicitly throughout society, including schools, at home, in commerce, and in law-making, enforcement, and courts. Desegregation will address the tools of segregation, including policies and practices, as well as the attitudes and opinions that reinforce them. The second step is integration of youth. When young people are re-established in equitable relationships throughout society, including their relationships with parents, teachers, youth workers, police, and others, integration is present. It is a deliberate step meant to stop and reverse segregation. Supporting young people as adultism is defeated throughout society has to be done with deliberation and determination. Challenging adultism and fighting discrimination against youth must be situated in the larger struggle for nonviolence and social justice across our society. Awareness of these struggles and attuning with great legacies of transformation positions young people as the substantive leaders in social change they have been for more than 100 years. Following are three central elements in the scaffolding. The first column of scaffolding for youth integration is Culture. Culture is made of the beliefs, habits values, visions, norms, systems, and symbols within a specific and definable community. Adultism is made in the fiery furnace of culture, as groups of people work together to define and reinforce stringent perspectives that re-enforce adultism. In the same way, culture can help examine those assumptions and redefine them in line with social justice through youth integration. The named activities, policies, strategies, processes, allocation, coordination, and supervision of people throughout a community happens through the structure of a definable group of people. In schools, structure includes school rules and curriculum; in society, it includes laws and policing. Structure makes things happen, enforces those things, and encourages them. Structural change promoting youth integration requires deliberate action for transformation. It should actively engage young people in equitable relationships while establishing and maintaining adult allyships. Where culture and structure belong to a group, attitude belongs to individuals. “Your attitude determines your altitude” applies to adult understandings of youth: “Adult attitude determines youth altitude.” In our adult-dominated, adult-driven society, young people are subject to and subjugated by adult opinions, actions, attitudes, knowledge, and beliefs. This is the full effect of adultism. In order to counter this effect, we must change our own attitudes and provide opportunities for the people around us to change theirs, including youth and adults. This takes new ways of communicating, interacting, and being. It takes personal engagement within our selves and throughout the worlds around us. We must address each of these elements when we seek to integrate young people in any part of society. Each is present throughout all the formal and informal institutions throughout our society. 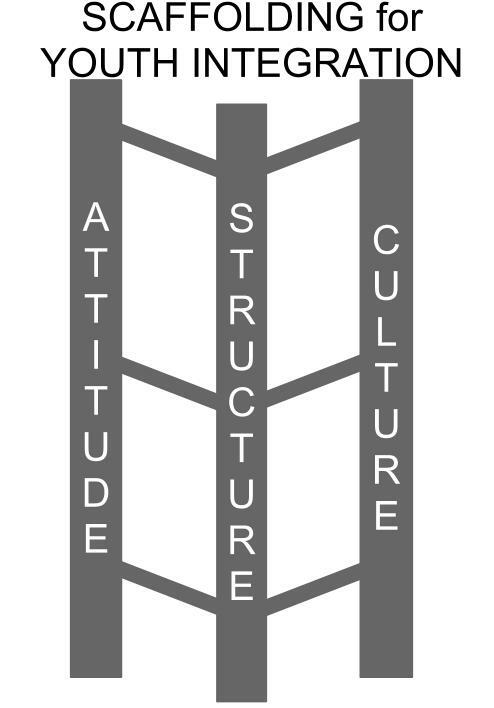 You can find culture, structure, and attitude in individual homes, schools, governments, and other places. By creating scaffolding for youth integration, we can re-negotiate adultism throughout our lives. Order FACING ADULTISM by Freechild founder Adam Fletcher! Based in Olympia, Washington, Freechild works internationally to advance youth engagement. To learn more, contact us! All content © 2019 Freechild Institute. All rights reserved. Contact us for information. Freechild Institute, Proudly powered by WordPress.